Grab Shot 29 - "Gnome Court"
"A neighbor of mine, whom I've never met, often sits in this swing and watches the world go by," said Charlie Solomon. 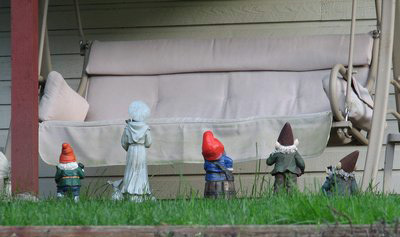 "Only when I got a little closer (one day when he wasn't there) did I realize that he's got all these gnomes (and maybe an angel) set up as though they're paying attention to him, maybe as if he's holding court with his advisors, the gnomes." Charlie used a Canon PowerShot S2 IS set to 1/60 at f-4 to capture this grab shot. If you have an interesting candid you'd like to share, take a look at our Submissions page, then send us your Grab Shot. If we publish it, you'll receive an ultra cool custom carabineer keychain.